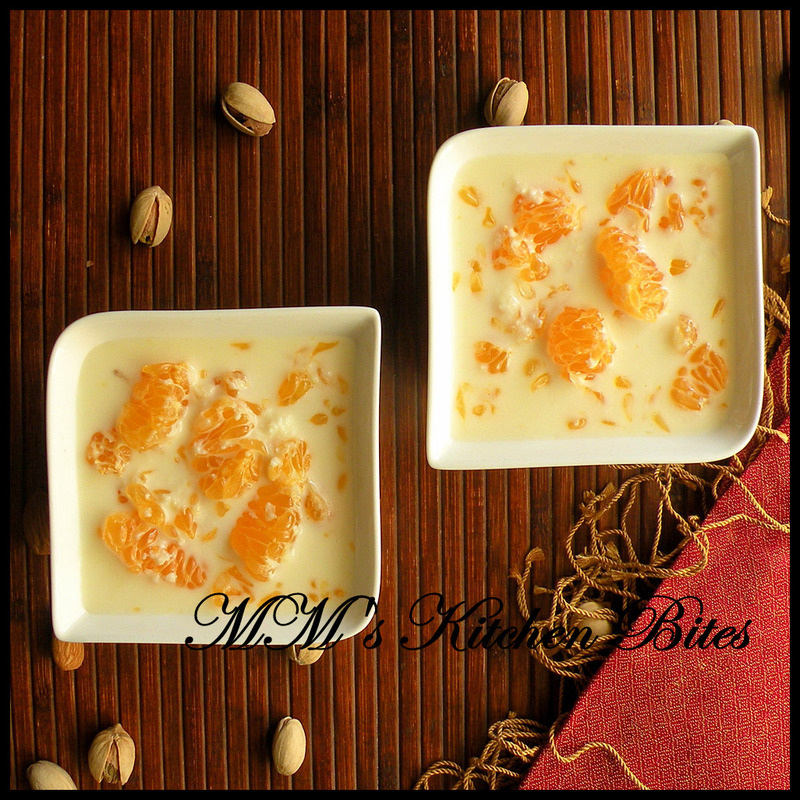 MM's Kitchen Bites: Kheer Kamala/Orange Kheer....with wishes for a happy new year!!! Kheer Kamala/Orange Kheer....with wishes for a happy new year!!! Peel the oranges, seperate the segments and remove the membrane and seeds from every segment. Break/Chop the oranges into bite size pieces and keep aside. In a thick bottom non stick pan add milk and bring it to a boil. Reduce the heat to medium and stirring continuously, continue heating the milk till it reduces to half in quantity. Add sugar and stir, till it dissolves completely in the milk. Turn off the heat and let it cool completely. Let the milk rest in the refrigerator for 1/2 hour. Add the orange chunks and refrigerate for 3-4 hours. Serve chilled. The milk must be cooled completely before adding oranges otherwise the milk will curdle. You can add saffron, if you want, after taking the milk off heat. You can garnish with almonds and pistachios. quite an interesting kheer.love the combo. that was fast Meena! :-) ...try it,promise it is totally worth it! wow...intersting recipe. I am big fan of sweets....I will try and let u know!!! Would this work with a milk alternative, such as coconut or almond milk? Guessing full fat coconut milk might be a better option, with coconut palm sugar or other sweetener of choice.